If you’ve never made the pilgrimage to the historic Theatre at Ace Hotel in DTLA, I strongly suggest finding the time to take in a show or a movie and go. Once the flagship screening facility for United Artists during the early part of the 20th century, the Spanish-Gothic theater is truly a must-see. And this past weekend, it was ground zero for Sundance NextFest 2017—a three-day event bringing the year’s boldest indie movies and hippest music directly to the heart of Los Angeles. 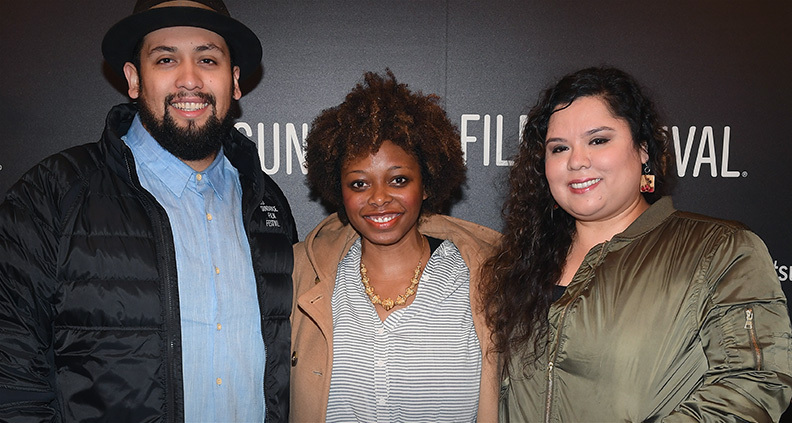 First up on Saturday was the wonderfully written and produced series Gente-fied, directed by Film Independent Fellow Marvin Lemus (Project Involve 2015) and co-written by Lemus and Linda Yvette Chávez (Fellow, Project Involve 2010; Screenwriting Lab 2015.) 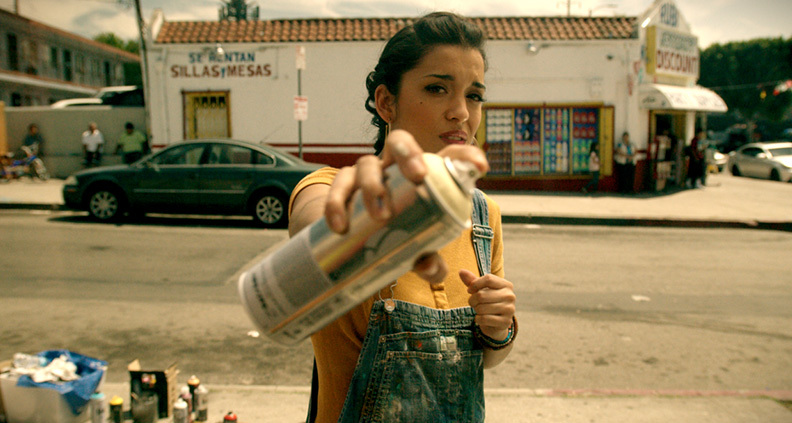 The festival screened all seven episodes of the show, each focused on one of seven characters dealing with life and the effects of change in LA’s redeveloping Boyle Heights. From the moment Lemus stepped onto the stage to introduce the series, his humor and excitement came shining through—in hindsight, an indication of what was to come during the post-screening Q&A. 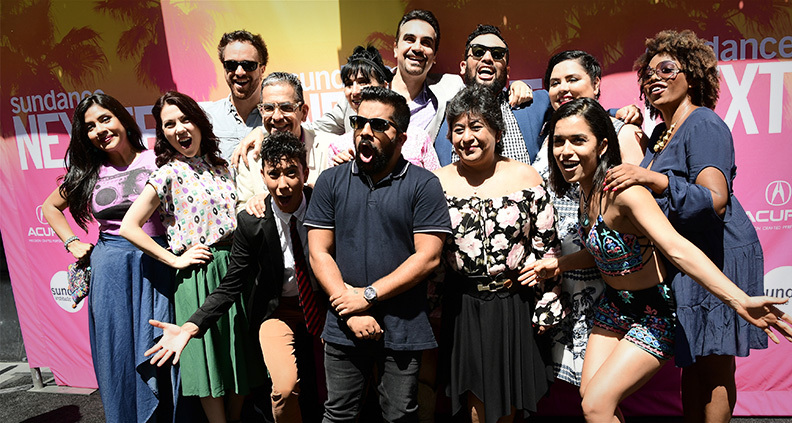 Along with their stellar cast, the Gente-fied filmmakers do a wonderful job presenting characters with complexity and depth, dealing with subjects that might on the surface seem like familiar Latino tropes. Yes, there’s a mariachi band that is the focus of one episode. But the story deals with the themes of friendship, generational divides and machismo. And yes, there’s a character that’s a graffiti artist. But she’s a lesbian dealing with how to honor her talent as an artist while at the same time showing respect for her elders. Though the overarching focus is on identity and the impact of gentrification, there are laughs—a lot of laughs. After watching all seven episodes, I’m excited to spend more time in this world with these characters—good thing, since the series is currently being developed for television. Following the screening, Ferrera, Williams, Lemus and Chávez joined screenwriter Josefina López (Real Women Have Curves) and community organizer Nancy Meza of Defend Boyle Heights for an in-depth discussion of the series as well as diversity in film and the ongoing gentrification in Boyle Heights and other areas of LA. Justin Simien (Dear White People) served as moderator of the panel, which was both impassioned and insightful. Lemus spoke about wanting to create a “neighborhood” in this series—a community of characters with all the complexity that comes with the collision of people who see things differently and all feel are right in their own specific way of thinking. Chávez was also excited to show the generational differences in the use of language, which she felt was “so well supported by our actors.” Chávez said. López made the point of why she finds gentrification so upsetting, to resounding applause. “Culture is about showing your specificity, your passion,” she said. “Nobody wants their community to turn into a IKEA catalogue. We don’t want that in Boyle Heights.” To that end, the creative team of Gente-fied made sure to include Meza in the process of developing this project. The result was clear: the series’ subject matter truly stuck a cord with NextFest audiences. To learn more about Film Independent’s many Artist Development programs, just click here. For more Film Independent, be sure to subscribe to our YouTube channel and be our friend on Twitter, Facebook and Instagram. If you’d like more information about how to become an ongoing Member of Film Independent, just click here.